It’s difficult to know where to start when writing about the Belgium team ahead of tonight’s friendly match with Australia. So much has been happening off the pitch since the World Cup, it’s not easy to say much about the forthcoming game that is at all relevant. For the past couple of years, the Belgium team have been climbing up the FIFA rankings, which are not particularly relevant either, with the result that – certainly at the World Cup – they were many people’s favourite second team. The performances in Brazil probably lost the team quite a few admirers. Despite reaching the quarter finals, they only showed any semblance of form when they beat the USA in the one match that got people on the edge of their seats. 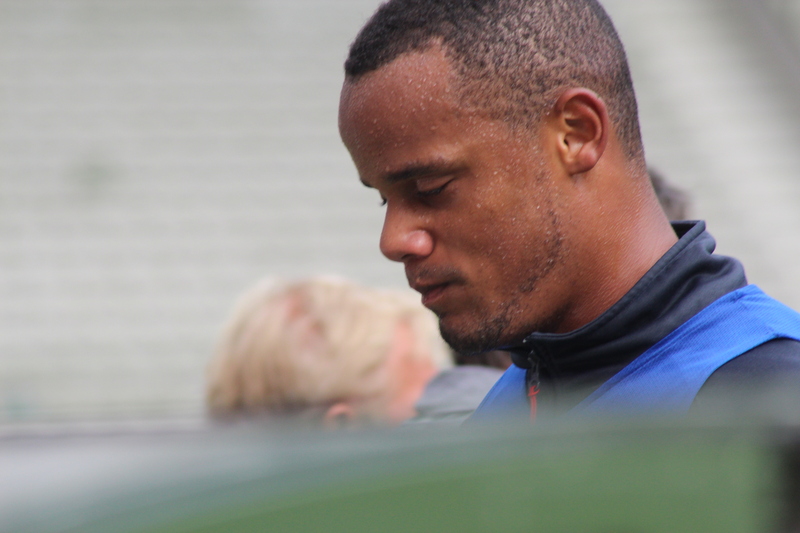 Captain Kompany – strong man in the set-up but could be missing from the action again. Marc Wilmots came in for a fair amount of criticism for his tactics, or rather a lack of them, but that shouldn’t have come as a surprise as he’s new to the coaching game. He’s continually refused to admit he needs someone to help him on the tactical side, saying that most of his players are experienced and, for example, don’t need advice on how to take corners or free-kicks. Since Brazil, however, stories have started appearing in the media about dissent in the camp. It’s said that senior players, not named of course, are not happy and feel they need a more experienced and tactics-savvy man at the helm. 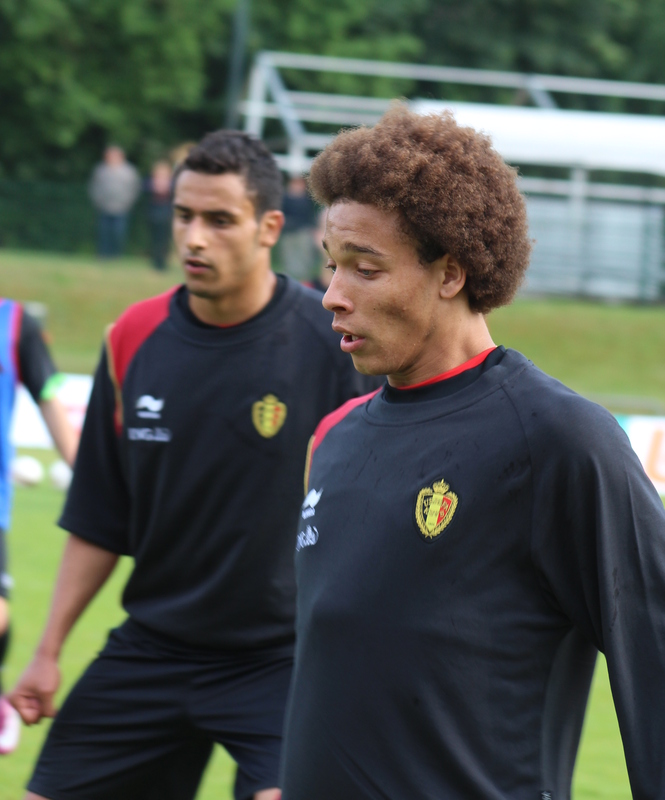 At the same time, reports say that Wilmots has the full support of Vincent Kompany. If true, that should be enough to keep him in his job for the moment. During the World Cup, media stories appeared saying that, again, senior players were not happy that Kompany was being accorded preferential status. The captain avoided appearing at press conferences, always being replaced at the last moment, and was not available to speak to the national press. When he was uncertain to play, no one in the squad knew until the last minute if he would appear and Wilmots said that the decision would be left entirely to the player. It’s unlikely that Wilmots would say that about anyone else. Indeed, the coach’s great strength has been that he’s not bowed down to ‘stars’, even though almost the whole squad are with Premier League clubs and earning a fortune, far more then Wilmots himself. Unfortunately, the problems don’t lie solely with Wilmots and the squad. In parallel to the stories about dissatisfaction in the camp, there have been reports about total incompetence off the pitch. The focus has been on the famous hotel reservations for WAGS which, after Wilmots said – before the tournament – that they were not welcome, were not cancelled by the Football Association. The bill came to 300,000 euros. Assuming that there had to be a finite number of wives, that left room for an awful lot of girlfriends. Then there was the infamous ‘camp’ set up for supporters by the Belgian FA in Brazil. Conditions were said to be deplorable and complaints have been received at the FA’s ‘Glass House’ in Brussels. Furthermore, senior members of the Belgium FA, led by CEO Steven Martens, are apparently entitled to bonuses based on the squad’s performances. Added to that is the speculation that the bonuses were agreed by a committee that included Martens himself. As for the players, many fans – especially younger ones – will feel let down by the team’s refusal to return home to a hero’s welcome. During the World Cup, support for the team was at a fever pitch and the whole country came to a standstill when the team played. Even before the team left for Brazil, some 20,000 fans had watched training sessions. One can understand that the players were disappointed not to at least reach the semi-finals but to snub the fans – as they apparently did – in saying no to a ‘welcome home’ party fans showed a lack of judgement at many levels. In the event, the players made a half-hearted appearance on the balcony of the Hotel de Ville in the famous Grand Place in Brussels; however, that was only after an intervention by Prime Minister Elio Di Rupo. Before Brazil, comparisons had been made with the triumphant scenes in the Grand Place back in 1986, when Belgium had – somewhat fortuitously it has to be said – reached the semi-finals. Back in 1986 though, the players were simply footballers, this generation are multi-millionaires. 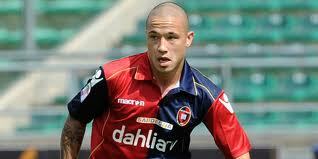 Radja Nainggolan – he should get 30 minutes tomorrow at least. Against this background, the match with Australia pales somewhat into insignificance. Today’s news was that Kompany has a calf injury and is unlikely to play. That would be no surprise as the captain has only played in four of the past 11 friendly matches. Prior to that Eden Hazard and Romelu Lukaku, who probably wouldn’t have started, both withdrew from the squad. With Thomas Vermaelen and Marouane Fellaini out injured and with Daniel Van Buyten having hung up his boots, there will be a few new faces on view – certainly when the substitutes start appearing. Perhaps the most interesting aspect on the sporting front is Wilmots’ acknowledgement that Zenit’s Axel Witsel will have a freer role. After a couple of seasons keeping guard in front of the back four, Wilmots has said that he will share that duty tomorrow with Anderlecht’s Steven Defour (4-2-3-1). If things go awry though, Wilmots has said he’ll revert to the standard set-up. Apart from that, it was good to see Wilmots say that Roma’s Radja Nainggolan will get 30 minutes, although he’s worth more than that. Next Sunday, the Belgian FA have organised a Fan Day … in Ostend. That’s met with some criticism from those in the south of the country and after the refusal to meet the fans when the team returned from Brazil, there’s a feeling that this is too little, too late. I’ve used Hotel de Ville and Grand Place as Brussels is primarily French-speaking. In Dutch, the equivalents are Stadhuis and Grote Markt. A welcome return to the international football scene for the thinking woman`s Jimmy Hill. I think the belgian FA is frankly taking the p*ss. I wait with baited breath for the next installment. ps. Why hasn`t Franck Moussa been picked yet? Bloody hell. I haven’t even told the Twitterati it’s out there and the Cisco Kid is on it. Good comments and I’ve got a call into Wilmots about Moussa. I’ve just been talking to Australian Radio – it was the middle of the night there so I expect listening figures could be low.